Losing your important WhatsApp messages is a possibility. This has happened to a lot of WhatsApp users. Maybe someone deleted the application from your device by mistake. Maybe you had to uninstall it and re-install the application yourself to eliminate a bug that had been making the app misbehave. Maybe you never uninstalled the application but someone deleted your messages. Irrespective of how you lost your WhatsApp messages, you will want to know whether it is possible to recover WhatsApp messages online and how. In this article, we intend to explore the topic of whether you can recover WhatsApp messages online free. If you have never had to recover your WhatsApp messages, you will wonder whether this is even something that can be done. We will start by seeing whether it is possible to recover deleted WhatsApp messages online. Part 1: Can I Recover WhatsApp Messages Online? Yes. It is possible to recover WhatsApp messages online. Step 1: First make sure that a backup is available. To do this, open WhatsApp > Click Settings > tap Chats > Click Chat Backup. Step 2: After verifying that a backup is available, uninstall your WhatsApp. Launch the App Store and re-install the application again. Verify your phone number and you will get to see a welcome notice that prompts you to restore your chat history. 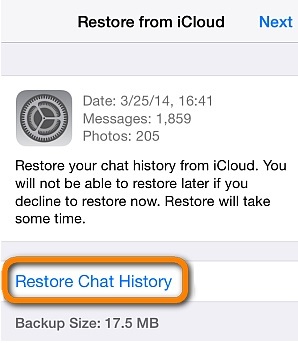 Simply click Restore Chat History and you will be able to recover WhatsApp messages online free. If you haven’t turned the WhatsApp automatic backup on your iPhone but you had created a backup for your whole device recently using either iTunes or iCloud, you can restore the backup to your device. After the restoration, your messages should be available. However, it is important to note that restoring the WhatsApp messages to your device using the iCloud or iTunes full backup can do more harm than good. It will overwrite all the data you have on your iOS device currently. Check here if you need a selective restore. The second method is highly recommended and we will introduce it in detail in Part 2. Just follow us. Maybe you do not have a WhatsApp backup. Maybe you do not want to uninstall your WhatsApp and re-install it just to be able to recover your messages. This will have you wondering whether there is a better and easier way to recover deleted WhatsApp messages online. There is a tool that you can use to recover WhatsApp messages online without using too much of your time. The tool is known as iMyFone D-Back. 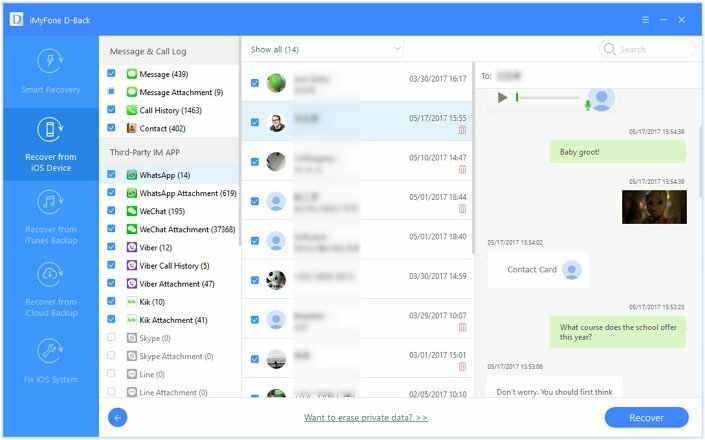 iMyFone D-Back will allow you to recover your deleted WhatsApp messages without having to use a backup. If you have data that you need to recover from any of your backups, the tool will allow you to recover them too. iMyFone D-Back is capable of recovering data from iTunes and iCloud backups. 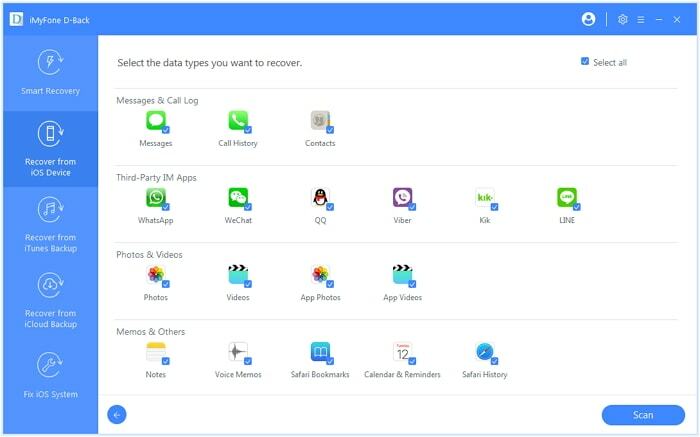 It will allow you to recover Viber, WhatsApp, Kik, Line, Messages, Notes, Contacts, etc. Step 1: After launching iMyFone D-Back, click Recover from iOS Device. Tap Start. Step 2: Connect your iOS device using a USB cable to the computer. 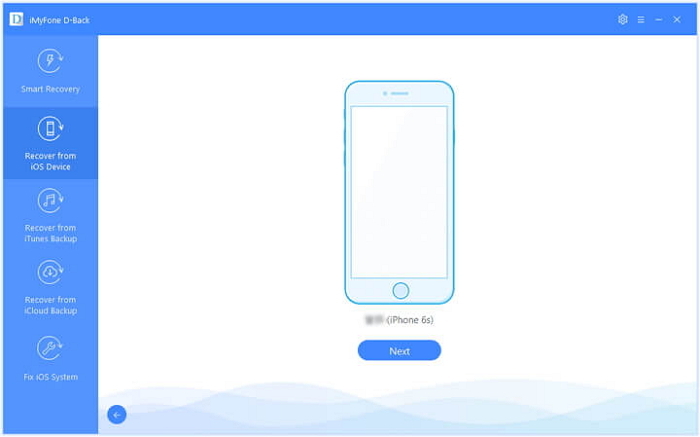 iMyFone D-Back will recognize the device automatically. Click Next to proceed. On the next screen, choose the files you would like to recover. You can select only WhatsApp if that is what you would like to recover only. You can also select any other file type you would like to recover from the options available. Click Scan. iMyFone D-Back will start looking for the deleted files. Step 3: After the scan is finished, all the files that you can recover will be displayed. These will be organized on your screen. You can click on any category to view the data available. You can select “Show only the deleted files” to preview only the data you have already deleted. You will be able to select the data you would like to recover. 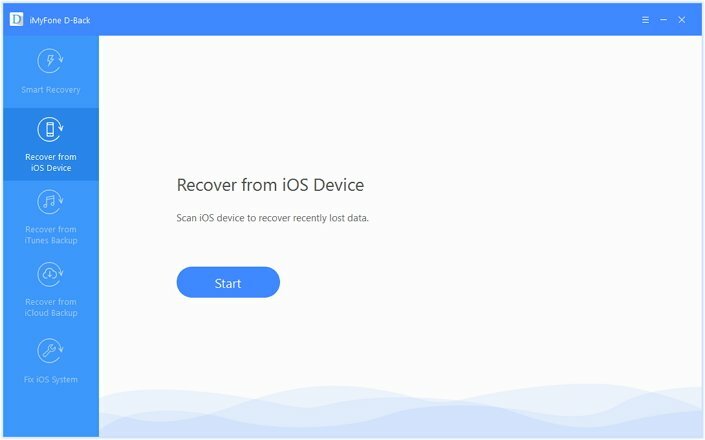 After selecting the files you would like to recover, tap Recover. This option is available on the bottom-right corner. In the popup that appears, choose a location where you want the recovered data to be store. Just give iMyFone D-Back a few minutes for to help you recover your data online. Can I Recover WhatsApp Messages Online Free? For now, there is no 100% free software that you can use to recover deleted WhatsApp messages online. However, it is possible to get a data recovery tool that offers a free trial version. Such a tool is available. iMyFone D-Back does have a free trial version. It allows you to try it out and determine whether it works before you get to pay for it and enjoy even more features. The trial version will not recover your data. However, it will allow you to view the recoverable deleted files. When you pay for the full version, you will have the ability to recover your deleted files. The files you can recover with the full version are the ones that you can view using the trial version. If you did lose your WhatsApp messages, you can recover them online. 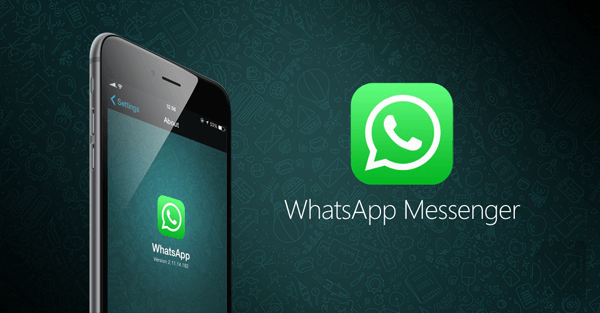 This article shows you the different methods you can use to recover WhatsApp messages online. The best way to recover your messages would be to use iMyFone D-Back. This tool has a free trial version that allows you to view your deleted messages. When you upgrade to full version, you will get to recover your data. It can be used on both the Mac and Windows PC. Feel free to leave your comment below.